Eastern Bank Job Circular 2018 has been published in the official website of Eastern Bank Ltd. Eastern Bank Ltd Job Circular has been published for vacant positions of Trainee Assistant Officer. Eastern Bank Ltd Job Circular 2018 related all information is available my website. Eastern Bank Ltd is all about choosing one’s own vision; it’s more than about choosing his/her job. So eligible candidates are requested to apply for the positions. Some important information and circular are found my website so you get the information and download the circular. To know more details please see the original Job Circular. Eastern Bank Job Circular 2018. ■Job Description: Any persuasion will disqualify the candidature. This job position is a challenging career with superb prospects for ownership and success. ■ Education Qualification: Minimum graduate in Business Studies. Interested Candidates will be treated strictly on merit and any sort of persuasion will result in disqualification. Only shortlisted candidates will be communicated. If you are interested in the career with Eastern Bank Ltd. (EBL) then you can register yourself anytime at Eastern Bank Ltd. e-recruitment system by filling Eastern Bank Ltd. online application form. 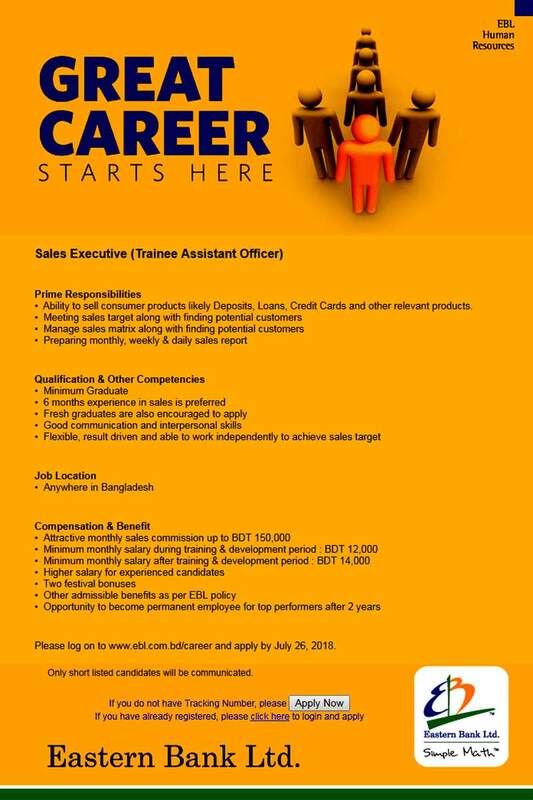 Eastern Bank Job Circular Trainee Assistant Officer. Eastern Bank Job Circular 2018.